Like many of her Pintupi tribeswomen, Makinti Napanangka began painting in 1994 during the women’s painting project organized for the Haasts Bluff and Kintore communities in the western desert of Australia. This project, held at a female sacred site away from their men folk, marked a major development in contemporary desert art. Many of the women who participated went on to gain wide public acclaim as successful, full-time painters for Papunya Tula Artists. At this time Makinti was in her mid-sixties. She had walked into the Haasts Bluff ration depot during the 1940’s with her young son. By the time she had moved to the new settlement of Papunya, Makinti had also given birth to a daughter. Later, as the outstation movement gained strength, she returned to settle five hundred kilometers west of Alice Springs at Tjukurla, close to Mangarri where she was born. From the outset Makinti’s bright palette, impasto surfaces, and loosely worked geometric compositions attracted art buyers. Her works were characterized by bold gestural linework evoking body paint applied onto women during ceremony by using fingers dipped in earth ochres. Her paintings mimic the chanted narrative of her songline as she tracks and revivifies her two female ancestors, the Kungka Kutjarra, as they dance their way across the country. Their travels follow the desert water sources, most especially Lupulnga, the rockhole where she was born and where her connections to her spiritual origins are felt. In the painting illustrated titled Lupulnga illustrated above, the Kungka Kutjarra visit the southern side of Lake MacDonald. Here they dug for Kuningka, the small western quoll which lives in burrows. These were dug by other animals such as the bettong or rabbits. Occasionally the quoll is found in hollow logs. The lines represent spun hair which was made in to hair string belts and skirts. 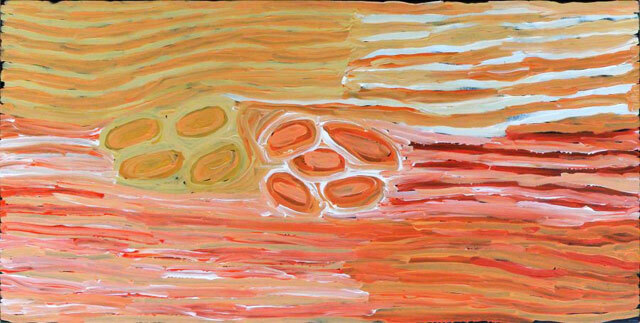 The painting was created for Papunya Tula Artists in 2004 and measures 61 x 122 cm. Although a tiny woman, Makinti commands a strength of purpose and a presence that has been vital in furthering the momentum of the desert painting community and is recognized as one of Papunya Tula’s leading artists. Following several important solo exhibitions held at Utopia Art Sydney in 2000 and 2001 and at Gallery Gabrielle Pizzi, during the following year she was listed amongst Australia’s 50 Most Collectable Artists in Australian Art Collector Magazine. She continued to be listed every year thereafter until 2007. While Makinti is considered a key member of Papunya Tula Artists, and her name has been listed as a director of the company, she has increasingly painted for a range of dealers in Alice Springs outside of the ‘company’ during recent years. While many of her works produced for these alternate sources are equal in quality to works produced for Papunya Tula, the market, currently deeply concerned about provenance issues, does not rate them as highly. This is evidenced through lower purchase prices and the fact that seven of the top ten and sixteen of the top twenty prices at auction have been achieved for works bearing Papunya Tula provenance. In 2008 she was awarded the National Aboriginal and Torres Strait Islander Art Award for a work submitted by Papunya Tula. While the award winning work itself may not have been her finest, those present overwhelmingly endorsed the award given the quality of her works over a sustained period. In making this decision the judges demonstrated their support of art centre provenanced works. Since 2007 her work has varied in quality and become increasingly untidy. Makinti’s best year at auction was 2005 when twelve of the eighteen works on offer sold for a total of $182,513. In 2009 eight sold of fourteen offered for an average price of just $8,884. However the largest of these were 122 x 122 cm and 90 x 150 cm in size. This underpins the fact that the vast majority of her lesser results have been for smaller works or paintings with provenance other than Papunya Tula Artists. Her current record stands at the $72,000 paid for a beautiful Papunya Tula painting Lupulnga 2003 at Sotheby’s in July 2006, which carried a presale estimate of $60,000-80,000. In May 2005 at a time when Papunya Tula provenanced works by Makinti was not such a focus, $60,000 was paid at Lawson~Menzies for a 300 x 180 cm work, currently the second highest price for a Makinti work at auction. Although having Papunya Tula provenance generally adds value it is the work itself which is the ultimate determiner of the value of Makinti’s works. Her career output is relatively small yet as she edges toward the end of her life, her paintings are increasingly highly regarded. I would expect the prices of her smaller paintings to rise considerably the next decade and her major works to fetch an ever-increasing premium once the primary market for her work dries up.